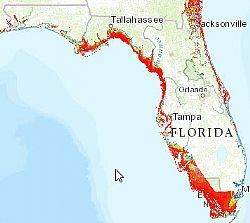 The Storm Surge Inundation Map is an interactive map that illustrates the current worst-case storm surge and inundation scenarios on the American Gulf and Atlantic coasts, including Puerto Rico and the U.S. Virgin Islands. The map combines data layers from FEMA 100 and 500 year flood maps as well as NOAA's Sea, Lake, and Overland Surge from Hurricanes (SLOSH) and the National Hurricane Center's coastal county hurricane strike maps. Explore the map at: water.epa.gov. The Scenario-Based Projected Changes Map is an online map that provides easy access to localized scenarios of projected changes in annual total precipitation, precipitation intensity, annual average temperature, 100-year storm events, and sea-level rise from EPA's Climate Resilience Evaluation and Awareness Tool. To explore local climate change projection data across the United States, simply zoom in on a location of interest or type a location into the search field of the map. Climate change projection data within this map is provided by grid cell, illustrated as a square grid with 1/2-degree resolution, approximately 32 x 32 miles, for the United States. Explore the map at: water.epa.gov.